Henry Ware was born in Hingham, Massachusetts, in 1793. His father was a Unitarian minister; afterwards a Professor in Harvard College. 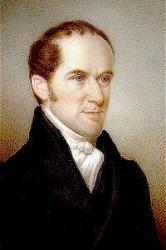 Young Ware graduated at Harvard, studied theology, and became minister of the Second Unitarian Society, in Boston, in 1817. After a ministry of twelve years, he made a foreign tour, and on his return was elected "Parkman Professor of Pulpit Eloquence and Pastoral Theology" in Harvard College. In this position he obtained eminence. He died in September, 1843. His collected works in four volumes, were edited after his death, by the Rev. Chandler Robbins. 1. All nature's works His praise declare. Opening of an Organ. Dated Nov. 9, 1822. It is in Horder's English Congregational Hymns, 1884. 2. Around the throne of God The host angelic throngs. Universal Praise. Dated 1823, and printed in the Christian Disciple, vol. v., and in Putnam, 1874. A fine hymn of praise. 3. Father of earth and heaven, Whose arm upholds creation. Thanksgiving for Divine Mercies. Appeared in Cheever's American Common Place Book, 1831; and in Lyra Sacra Americana, 1868. 4. Father, Thy gentle chastisement. In Sickness. Dated March, 1836; and in Lyra Sacra Americana, 1868. 1819. Given in Lyra Sacra Americana, 1868, and Putnam, 1874. 6. In this glad hour when children meet. Family Gatherings. Dated Aug. 20, 1835. In Lyra Sac. Americana, 1868, and Putnam, 1874. 7. Lift your glad voices in triumph on high. Easter. Dated 1817, and was published in the Christian Disciple of that year, in 2 stanzas of 8 lines. It is in Lyra Sac. Americana, 1868; Putnam, 1874, and numerous hymnbooks. Sometimes stanza ii. is given separately as, "Glory to God, in full anthems of joy." 8. Like Israel's hosts to exile driven. American National Hymn. Written for the Centennial Celebration of the Boston Thursday Lecture, Oct. 17,1833, and given in Lyra Sac. Americana, 1868, and Putnam, 1874. It is a quasi American National Hymn in praise of the Pilgrim Fathers. 9. 0 Thou in Whom alone is found. Laying Foundation Stone of a Place of Worship. In Lyra Sacra Americana, 1868, and Thring's English Collection, 1882. 10. 0 Thou Who on Thy chosen Son. Ordination. Written for an Ordination, March, 1829. In Putnam, 1874, and Dale's English Hymn Book, 1874. 11. Oppression shall not always reign. Against Slavery. "This was Mr. Ware's last composition in verse. It bears date March 15, 1843. In its original form it is longer than as presented here [in 3 stanzas of 8 lines], and is unsuited to a church-book. The following stanzas, taken from one of the Collections [stanzas i., ii. are in Longfellow and Johnson's Book of Hymns, 1848] are a part of the original, altered and transposed, and thus adapted to sacred worship." 12. To prayer, to prayer; for the morning breaks. Prayer. This poem of 10 stanzas of 6 lines is dated 1826, and is given in Lyra Sac. Americana, 1868, and Putnam, 1874. Two centos therefrom are in common use The first begins with stanza i., adapting it for Morning, and the second with stanza ii., "To prayer, for the glorious sun is gone," for Evening. 13. We rear not a temple, like Judah of old. Dedication of a Place of Worship. This is dated 1839, and is given in Putnam, 1874. 14. With praise and prayer our gifts we bring. Opening of a Place of Worship. In Dale's English Hymn Book. 1874. Ware, H., p. 1233, i. Another of his hymns in common use is "Great King of all, our nation's God" (National Humiliation). His hymn "To prayer, to prayer," is in Cheever's American Common-Place Book of Poetry, 1831. Henry Ware, Jr. (April 21, 1794 - September 22, 1843) was an influential Unitarian theologian, early member of the faculty of Harvard Divinity School, and first president of the Harvard Musical Association. He was a mentor of Ralph Waldo Emerson when Emerson studied for the ministry in the 1820s.